My husband picked one up at Walmart on closeout....$3.00! It's not the prettiest looking thing....but our tomato plant is doing great and we don't need to worry about staking anymore! We planted one a month ago and its not looking too good..... followed the directions to the letter too. This thing is a crock. Ever hear of hydroponic gardening? Same thing. The claim that the nutrients get into the plant faster/better since it's hanging upside down is totally B.S. Ask any plant physiologist. Don't waste your money on infomercial garbage. I bought mine at BJ's for just under $9. My tomato plant (yellow pear variety) is doing just fine. I saw there is a now a strawberry plant topsy turvy. Has anyone seen this one in stores?? I haven't tried it but I've heard you can make your own upside down tomato plant with a gallon milk jug. 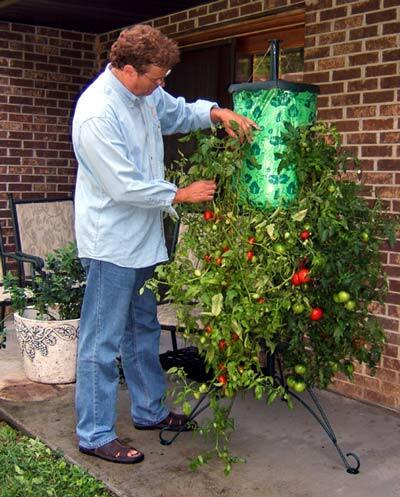 Fill the jug with planting medium, plant the tomato plant at the neck, cut out the bottom and hang it upside down. Might work. You can save yourself a bunch of money by making them yourselves, plus get an extra plant out of it. If you purchase the hanging pot with the coco bedding, just cut a hole in the bottom. Buy or grow a tomato seedling and put it in upside down (I usually use a little bit of bunched newspaper at the roots to make sure it doesn't fall out, and make sure to make your slit just big enough to get the plant inside), and the fill with topsoil. You can then plant another plant on the top. I prefer herbs, as they don't root too far and still look very nice. Just don't put any hot peppers, as they will make your tomatoes hot. You can reuse the hanging planter next year, and it is so much nicer to look at than the ones you see on TV. Totally clever, and would free up my containers for other plants. I see from another post that those viney cherry and pear tomato plants work this way too. Do you find you get less damage from slugs this way? I have some monsters here and I am always on the lookout for natural/organic ways to outsmart them; dirty little buggers! Wal-Mart has a knock off one called "Upsy Downsy" for under $10. I think the biggest benefit is getting the plant off of the ground and away from insects. I'm still waiting for mine to arrive. $27.00 for the planter from a catalog, and $3.99 for the tomato plant...failure is not an option. How many tomatoes do you think I could buy for $31.00? Another possible alternative for deck grown tomatoes. Can be used for other veggies etc. We love ours and is very consistant and easy to use each year. We got if for our old house which was very shaded. My wife has a small vegetable garden with tomatoes and uses the Earth Box on the deck because she loves it. I'm actually glad you opened this up for discussion. I live in Sweden and many things are difficult or a challenge to grow here vegtable-wise. Oh, you can grow lettuce and other root crops, but tomatoes are a challenge because of the warmth and heat factor. My problem though is that most of my yard is granite boulders with native birch and pine trees growong between the cracks in the rocks, so I've been looking to building raised beds, but this may do even better. Here's some photos for everyone. We haven't had any slug or other insect issues. For slugs, we do leave a pie tray of beer on the ground, which has pretty much eliminated the problem for us. You can use upside down method for any vine plants. We done beans and I'm considering trying grapes. Other than the hot peppers, I haven't found any plant combinations that didn't work. Other than herbs on top, I've also done strawberries and some flowering plants.